Found about 5 pounds of Oyster mushrooms today in southern Ohio. First time for me. What is the best method of cleaning and storing for long term? Do these dehydrate well or should they be sauted and frozen? I know some mushroom are ruined with a water bath. Freezing your mushrooms will allow them to keep their great flavour, but freezing leaves you with a soggier looking mushroom. Frozen mushrooms are ideal for soups, stews and casseroles. Using the method below your mushrooms should keep for about a year. Bring 1 l of water to the boil with ½ a teaspoon of salt. Add mushrooms and bring to the boil again. Stored properly, dried mushrooms have a more potent flavour than fresh ones, so you will use less dried mushrooms vs. fresh. Pre-heat your oven to 150°. Slice your mushrooms into slices about ½ cm. The thicker the slices, the longer they take to dry out. Arrange your sliced mushrooms on baking trays in a single layer. Bake your mushrooms for 1 hour and remove from oven. 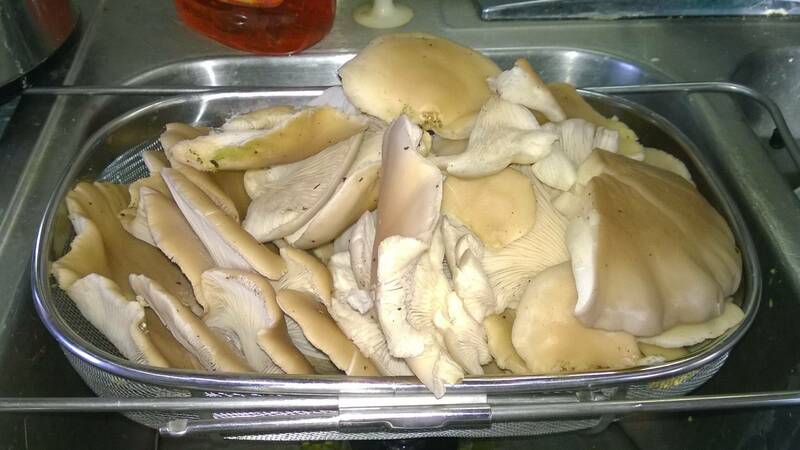 Use some paper towel to gently dab any moisture that sweated out from your mushrooms. Turn your mushrooms over and cook for another hour. By now your mushrooms should be completely dry. If not, repeat Steps 4 and 5 until they are dry. Allow them to cool, and then store them in an air-tight container in a cool, dark place. Your mushrooms are ready to store when they feel dry when you touch them. They should still be flexible A good idea is to add a wad of paper towel at the bottom of the jar - just to absorb any moisture that might still be lurking around. To Rehydrate Put your mushrooms in a bowl of warm water for 30 minute or if you are in a hurry, bring a pot of water to the boil and simmer your mushrooms for 10 minutes Keep this liquid for stocks, soups and sauces by pouring the liquid into an ice tray and freezing. When you need it, just pop the frozen stock into the pot.